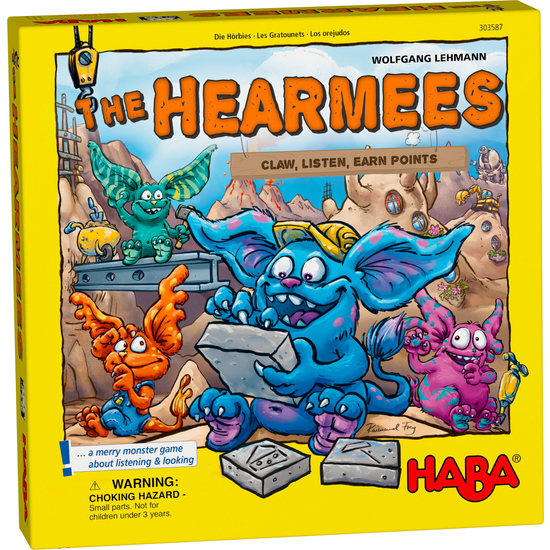 Listen up, Hearmees builders! We need to expand our city! The supervisor whips out his clawky-talky and claw-it…and off we go. Behind his screen, the boss claws pictures. All other players listen closely and guess what object is meant to be built. Was it a hammer or was it actually a broom? Whenever a Hearmees has heard the right object, he has the chance to add one new building to his neighborhood. Who has a great imagination and the best ears and will finish his neighborhood first? Contents: 50 task cards (25 easy = yellow, 25 advanced = blue), 25 house tiles, 5 break tiles, 4 screens, 3 venture cards, 5 Hearmees tiles, 5 adhesive dots, 1 clawky-talky (board), 1 claw-it, 1 set of instructions. Short game instructions: • Lay out house and break cards face down. For each player: a screen, a tip card, and a Herbie tile. Construction manager gets the scratchophone instead of a tip card. • Scratch – hear – place Construction manager: Scratch on the scratchophone the picture on the task card. Other players: Secretly place their Herbie tile on the corresponding symbol of their tip card. • Did one or more players guess correctly? Turn over a house tile together with the construction manager. • Construct a Herbie city: Collect 4 different colored types of building and lay them down face-up in front of you. • The first player to collect 4 different colored buildings wins.